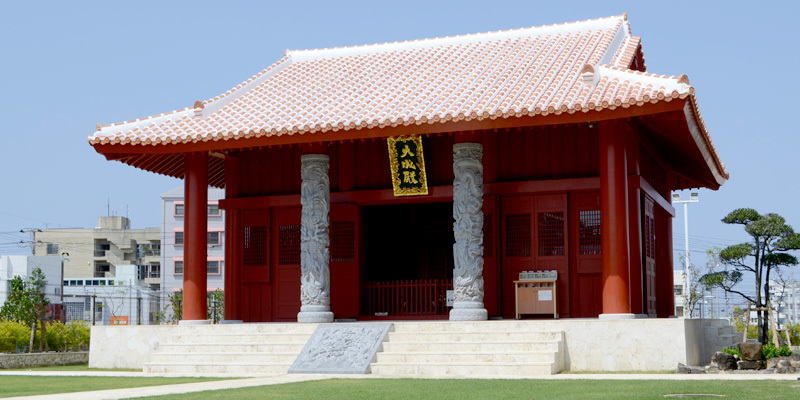 Beyond the Shiseimon Gate stands the Taisei-den, a red building with red-tiled roof of Ryukyuan architectural style. It is the sanctum hall of Shisei-byou. A calligraphy beautifully written by a member of the association reading, “Taiseiden,” is prominently displayed. It faces southward, as the ones in the Confucius sanctuaries of Taiwan and China do. The statue of Confucius and the shin’i (a deity) tablet are placed in the middle. Also, the tablets of the Four Disciples (Yan Hui, Zenzi, Zisi, and Mencius) are placed on adjacent sides. In the courtyard are a pair of dragon-styled pillars, which were modeled after the ones in the Dacheng Hall in Qufu, China. The staircase is inlaid with a large stone tablet and decorated with a dragon in the center. The dragon has five claws, the same as the dragon representing the Chinese emperor. In the Confucius sanctuary, people pray for fertility, family prosperity, and academic achievement and success in entrance examination.